With the help of our distinguished professionals, we have been able to bring forth an impeccable array of Gift Sets & Rattles. These products are also available in various colors, designs, sizes and patterns in order to suit the varied choices of the customers. The entire range of these products is designed in compliance with the latest trends and international quality standards. Also, clients can customized these products as per their need and preference. 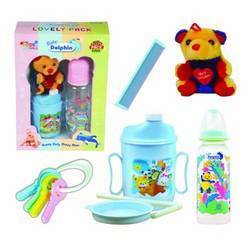 We are committed to offer our clients a wide spectrum of Baby Gift Set Lovely Pack. These products are hugely demanded in the market, as babies love playing with our colorful products. Owing to their features like high aesthetic appeal and attractive designs, the entire range of products are widely appreciable by our valuable customers. Further, to make the babies face smiling, these packs are also available in vibrant colors, attractive designs and patterns. Our esteemed clients can avail from us Baby ElephantRattle in different sizes, designs and colors. In addition this, they can also avail these products in customized forms, made as per their requirement. Products, that we offer are developed by making use of premium quality food-grade plastic along with advanced machinery in hygienic conditions. We hold expertise in designing and developingBaby Elephant Rattle. This is an unique products which spins in clock wise direction and takes same number of reverse turns. The offered products is manufactured by making use of supreme quality required basic material, procured from the established vendors of the industry. Furthermore, we have designed this product in a such manner, so that it provide maximum entertainment to the children. 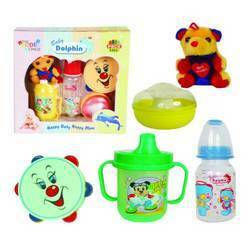 We are offering our clients with an apt Baby Gift Set Baby Pack. The offered gift pack comprises five kinds of rattles with musical qualities. Made of supreme quality food grade plastic, these offered items are highly appreciated for their smooth finish, adorable design and colors. Our clients can avail the offered products in both customized and standard forms as per their requirement.